Hope you enjoy this Walmart gift card! 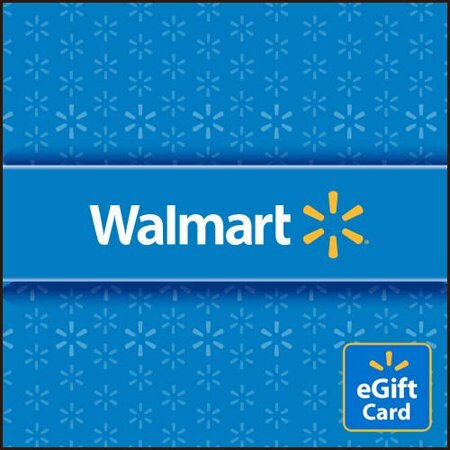 Convenient for you and fun for them, the Walmart eGift Card makes a great gift for anyone. eGift cards arrive immediately by email, or within 4 hours at most. Select the denomination and add the eGift card to your cart. We'll send you an email that includes the Walmart eGift Card number and PIN. Just forward the email to your chosen recipient and let them start shopping! Check Walmart eGift Card balance online. eGift Cards may be redeemed at Walmart stores, Walmart.com, Sam's Club and Samsclub.com by SAM's Club members, and at VUDU.com . By purchasing this eGift Card, you agree to the Gift Card Terms and Conditions. Saved by the Walmart eGift Card! Just when I though I couldn't spend my Walmart gift card with my PayPal balance i got to meet these beauty! I bought it with the PayPal balance I wanted to spend and got to my email in 2 minutes or less. Then I was able to spend this eGift Card with my original gift card and didn't need to put my card. I was literally saved by the Walmart eGift Card! This works very well- Iâve used this several times. You must slowly review and read as you order. You will see where you can add the recipients email- other wise it goes to your personal email or address. Credit cards take a few days, debit- credit card are the same. My son had no issues using it. Itâs a bar code, in the email that they display at the register to pay. My son had a flat tire and was by Walmart (but of course had no money) So we purchase a eGift card and he was able to get his tire and all is well!! He was literally saved by the Walmart eGift Card! Brilliant idea Walmart!! This is my second time buying this e-gift card. After i click place order i receive the gift card on my email in less than a minute. Then I always screenshot the giftcard's barcode for the cashier to scan it, however when I used this the cashier always have to call the supervisor because the card is asking for supervisor's password (i think) to proceed with the payment. It's not really a big deal because the supervisor always comes in a minute or two when they're not busy assisting other cashiers or they're not on break.